This weekend Noah had his first haircut. It was long overdue, he's nearly 18 months. His hair was forever hanging in his eyes, so off we all went. Isla had a trim too, to correct the wonky job I made a few months back! 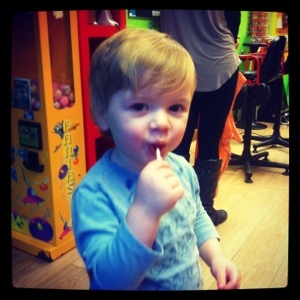 A lollipop was all it took to persuade him to sit in the chair and the end result was this! I love it. It's not too grown up, looks cute and he can now see. Win win! New member of One Direction?